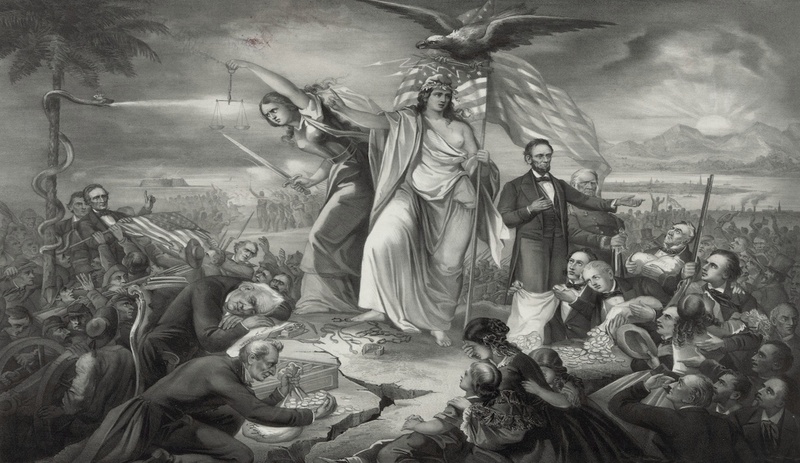 OUTBREAK OF THE REBELLION IN THE U.S.
LADY LIBERTY (WITH A PHYGIAN SLAVE CAP) REIGNS OVER CAPITOL HILL FLANKED BY JUSTICE (UNBLINFOLDED AND MENACING A SWORD) AND 16TH PRESIDENT ABRAHAM LINCOLN (GESTURING TO PROSPERITY OF THE WEST). DEMOCRATS BREAK THE CONTINENT IN TWO, DOWN A CRACK THAT LEADS BACK TO JEFFERSON DAVIS STUMPING BELOW A PALM TREE (AROUND WHICH WINDS THE PROVERBIAL SNAKE), WHILE OUTGOING PRESIDENT JAMES BUCHANAN (ASLEEP) AND TREASURY SECRETARY JOHN FLOYD (RAKING COINS INTO A BAG) FAIL TO SAVE MEN VOLUNTEERING LIVES AND RICHES AS THEIR WOMEN AND CHILDREN WEEP. You are here: Home / OUTBREAK OF THE REBELLION IN THE U.S.